Discover how your small business can benefit from adding a savings account. Do you have a savings account for your small business? If you answered yes, great! If you answered no, then you may consider opening one and here are a few reasons why you should. 1. For the “just in case.” “Everyone needs some amount of liquid cash in case something happens,” says Scott Cramer, president of Cramer & Rauchegger Inc., a financial planning firm in Maitland, FL. You’re always better safe than sorry, especially in the unpredictable business world. Financial challenges are never easy to predict, but when a drop in sales or business-related repairs occur, you’ll be happy to have the savings account as a holding tank, ensuring you’ll never completely be in hot water. 2. Fund protection. Business savings accounts are insured by the federal government up to a limit of $250,000, meaning your money is completely safe. So, if you keep your main checking account online, like most businesses, listen up. “Small mom-and-pop shops do not understand that banking online comes with serious risks,” says Brian Krebs, a cyber-security expert and blogger. And unlike personal financial accounts, business accounts are not always protected, and banks don’t always just put the money back if you were to get hacked. To protect yourself in the event someone does get into your account, a savings account provides that extra cushioning. 3. Boosts credit ratings. Having money in your business’ savings account can actually improve your credit ratings. Also, if you were in need of a small loan, you have a better chance of getting one approved by a financial institution because having a savings account demonstrates to them that you have the means to pay it back. 4. Set aside taxes. Encompassing an extra stockpile of cash in your savings account is great for when tax season rolls around. Businesses can often forget about taxes and fees that need to be compensated, especially when money is in a checking account. Business savings accounts can serve as a great way to hold money for quarterly or yearly taxes when the time arrives. 5. Earn interest. While the interest rate isn’t extremely high, keeping your money secured in a savings account still earns you extra money. If you’re choosing between what financial institutions of which to open your savings account, be sure to ask what the interest rate at each company, and how often the rate changes, before making a decision. 6. It’s never a bad thing. 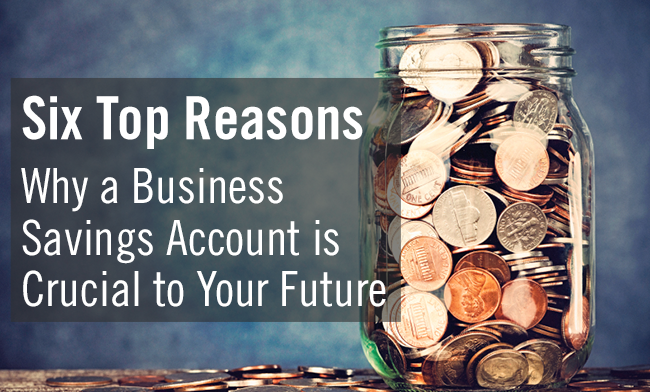 In other words, how would having a savings account hurt your business? Having money stashed away is something that will always be helpful in your career.